Keeping teens out of trouble is the goal of every parent, so it’s smart to have some fun party games for teenagers on hand when the party comes to your house. Because teenagers are probably the hardest group of people to entertain, you have to include games that they will think are “cool” and not childish. Teens want to have fun and socialize, and these games are the perfect substance-free way to keep them mingling and occupied. These party games for teens are more than just board games or playing charades; they are tailored ideas to help bring out the fun at your party while making sure that the teenage guests are not getting themselves into some kind of crazy trouble. This teen party game is not for the faint at heart. It’s a delightfully dark party card game in a hot pink toxic bucket. Players take turns devising plans to escape dangerous situations such as being swallowed by a whale or buried alive and other seriously bad scenarios using normally useless objects. It’s a fun death-dodging party game, really suited for those 16 and over. The game includes 400 seriously useless object cards, 100 seriously bad scenarios cards, two voting pads, two pencils, the aforementioned bucket and instructions. You can find your own Bucket of Doom at amazon. Grab a bunch of black balloons so that you have one for each guest at the party. Fill them each with different mysterious objects. Fill part of them with candy, part of them with dollar bills, and part of them with gooey, sticky substances like homemade slime, cooked spaghetti, shaving cream or whatever your imagination comes up with. Then, inflate the balloons and take them outside. Tie a rope between two trees or two tall objects and hang all of the balloons from the rope. Then, line the players up and give them each a toothpick. At the count of three, each player runs towards a balloon and pops it with their pick. Some are treated with candy, some with money and others with slimy, gooey surprises. Everyone knows the feeling of an awkward moment, and unfortunately for teenagers, these moments come more often than for most. Awkward Moment is a great card game to get your teens out of their comfort zone while not forcing them into “actual” awkward moments. Some players are dealt Reaction Cards while others are dealt Decider Cards. Those with the Reaction Cards get put into some seriously awkward or embarrassing situations while those with the Decider Cards decide how to react to those people. Hopefully, after playing this game, your teens will know each other a little bit better and be prepared for the real-life awkward moments in the future. Available at amazon. This is another super easy party game for teenagers. All you need for it is a sheet of paper! Cut the paper up into strips and write an “X” on one piece and let the players draw from a hat. Whoever gets the X is the assassin. The assassin’s goal is to kill as many of the other players as possible without getting caught. To do that, they have to make eye contact with someone else in the circle and wink at them. At any point, another player can accuse someone of being the assassin, but if they’re wrong, then they’re eliminated from the game. If they get it right, then the game is over and they win. Looking to move your party outside and get the teenagers more active? This is the game you need for your next teen party. 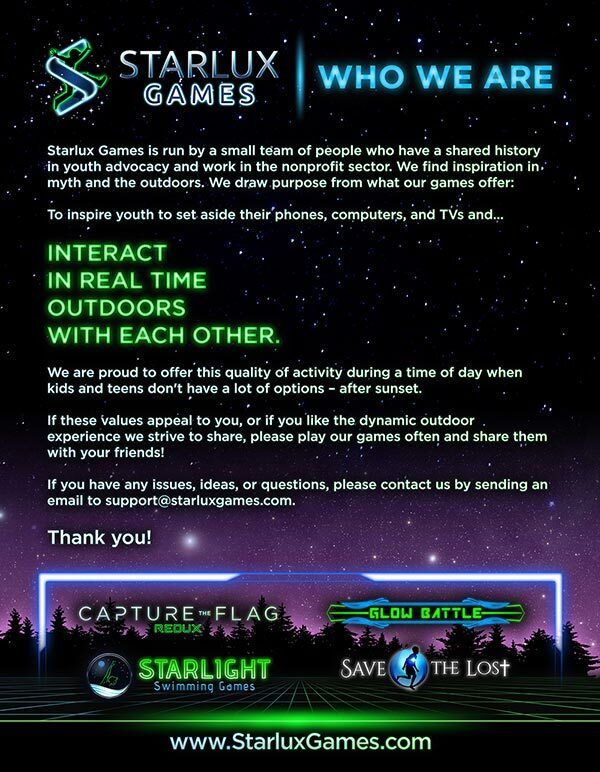 It’s the same classic Capture the Flag game that you know and love, but it’s been revolutionized with glow-in-the-dark lights. This game is perfect for keeping the party going with glowing orbs used as “flags,” color-coded LED bracelets that mark different teams, and light-up jail markers – all ideal for late-night fun. As an added bonus, each game box includes a rule-book and 12 game variation cards to help you switch up the game or play a totally different version for hours of fun. Purchase Capture the Flag REDUX here. Every teen has undoubtedly played “Would You Rather?” and now, this card game has brought it to a whole new level! Three or more players try and create the hardest Would You Rather scenario by combining two Poison cards. Every player anonymously picks their poison, and then comes the reveal. After that, you know who picked the right scenario, and who is crazier than you thought. This card game takes the classic teenage game and ramps it up a notch, making it an awesome addition to your next party. Available at amazon. If you’re looking for a game that will take your teens in some unexpected directions, then you have to have Quelf. This board game is completely controlled by the cards that you draw, and these cards could say absolutely anything. Have you balanced a shoe on your head before or wanted to sit underneath the kitchen table? Quelf can almost guarantee the chance that something just as bizarre will happen. The winner of over six awards for board games, this is the quintessential party game for teens. Available at amazon. Here’s another great game that can keep your teens occupied and doesn’t require a whole lot of preparation. Teams break into pairs of two and each team is given a piece of thick string threaded through the middle of a doughnut. Now, they have to eat the doughnut before the other teams without using their hands or arms. The trick is that they can’t let the doughnut fall to the ground, so a lot of strategy and teamwork is required. And, whether you win or not, it’s a “hole” lot of fun!